The Best Drone For Travel? The One With The Least Hassles. Deciding which is the best drone for travel in 2019? Trying to figure out how to travel with your drone without constantly fearing that airport security will confiscate your new toy? Which is the best drone to travel with? The best drone for photography? The best drone for hiking? 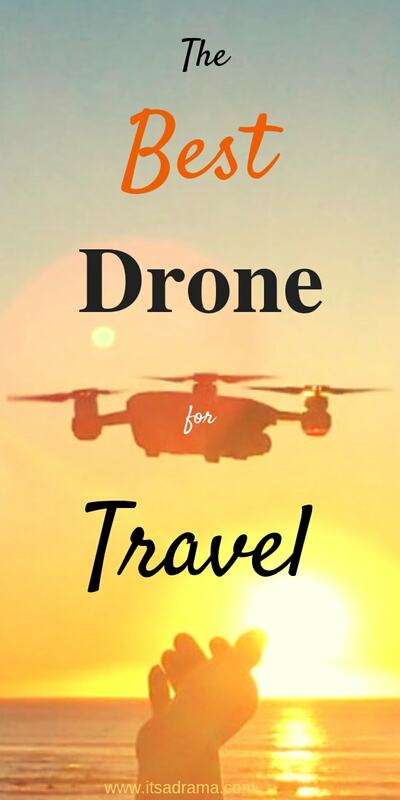 Or perhaps you are looking for the easiest drone to take around the world travelling. This post contains affiliate links. They cost you nothing extra but we make a small commission. These are all questions we can help you with. We have been travelling the world with a drone for a year and believe we have found the perfect drone for travel. 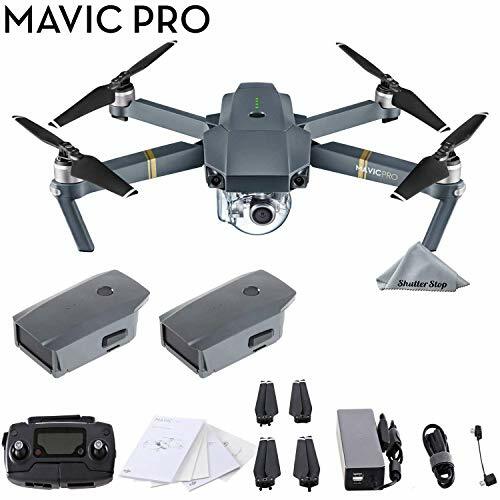 It is light, it produces superb quality footage and most importantly – it goes through airport security without any problems. We have travelled with our drone to Sri Lanka, India, Thailand, Vietnam, Japan and Europe capturing sensational footage. We are travel bloggers and vloggers and so getting the right drone was important. I will tell you about how each of these countries reacted to drones later in the post. Here were our top 3 choices in descending order. International Travel With A Drone. The Ease Of The DJI Spark. We are sticking with the DJI Drones. They are truly the best when it comes to travel. They are a global brand meaning that any accessories that you may need to buy can be found all over the world. Important for those of you who will be travelling far and wide with your drone. 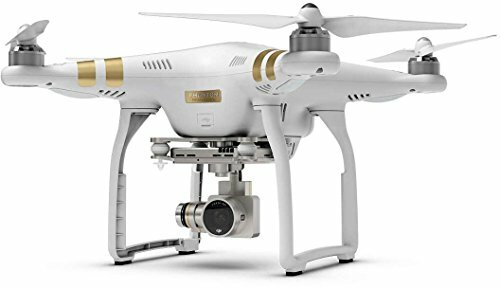 The Phantom 3 Pro is one of the best selling drones of all time. The quality of photography and video alongside the ease of flying makes this drone a great contender for the perfect travel drone. Return to home feature, GPS, flight paths, sensor stabilization and more. Has the choice of both app and handheld control. Price: A midrange price for a superior drone. Heavy. At 1.3kg this is heaviest of all three drones. Bigger: Meaning that it’s harder to conceal at the airport. Speed resistance. The Mavic pro will resist winds of up to 22.4mph. The best of all three drones that we reviewed. A whopping speed of 40mph. A maximum flight time of 27 minutes. Lots of gadgety extras that you would expect for this price range drone. Price. The most expensive of the three. While we believe the Mavic is a beautiful piece of kit, you must consider the possibility of having the drone stolen or confiscated at an airport while you are travelling. I don’t want to be a doom and gloom merchant but we have heard many stories of this happening to other travellers. Ask yourself if you can afford to wave goodbye to this kind of money. This is our drone of choice for travel and we couldn’t be happier with it. We have taken it all over the world and have never been stopped by customs. More about that later in the post. Here’s why we think the DJI Spark is the best drone for travel. Size. At just 300g this tiny drone is simply perfect for travel. It’s as tall as an iPhone and about as wide as a pair of sunglasses. The propellors fold in two, and it will take off from the palm of your hand. Built-in camera. The DJI Spark is classed as a selfie drone. I am travelling with two teenagers. What’s a day without a million selfies? Yes, I know there are selfie sticks, but who is going to want to carry one of those around for the day?DJI Spark hovers beautifully in front of your face and never fails to take the perfect selfie. Ariel shots for vlogging Ariel shots for vlogging are just out of this world. Watch the very first vlog Sonny, and I did with the DJI Spark, and you will see what I mean. You could never capture such footage without a drone. 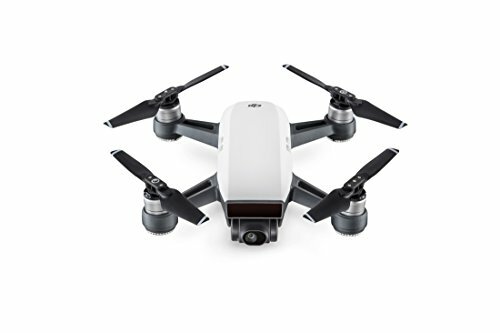 There is also a tracking device on the DJI Spark so that even if you turn and walk in another direction, it will stay focused on you. The ease of flying. The drone has obstacle avoidance meaning if there is a tree in the way it will fly around it. It also has a cool feature called auto positioning. If you drop the controls or take your hand off them for a minute, it won’t go zooming off toward the horizon. It will stay where it is due to auto levelling via GPS. You don’t even need a separate remote to control it. You can use your phone. Return to home within a metre. If you happened to lose contact, at least you can just call it back. Like a dog but without the vet bills. We loved this feature. The DJI Spark is robust. We have had a couple of drones in the past, and they have both been quite fragile. The DJI Spark is solid and sturdy, making it the perfect drone for travel. We just wrap ours in our clothes and pop it into the middle of our pack.UPDATE Oct 2018. We have been travelling with our DJI Spark for 12 months now and it is still in perfect condition. It’s been everywhere. The beach, the mountains, the Jungle and the desert. It’s amazing. The battery is light. We take two batteries with us, and still, it’s not heavy. The perfect drone for hiking while travelling. Weight is everything when travelling. It flys up to 30km an hour in sports mode. It is tiny meaning that the airport security never looks twice at the cute shoulder bag that it is stored in. The price! The cheapest of all three drones that we reviewed, the DJI Spark is the best value for money by far. We decided that IF we ever lost or had the drone stolen then the hit wouldn’t be too bad. Many features make this the best drone for travel, including the return to home within a metre feature. There aren’t many negative things I can say about the Spark but I will try. Spark only shoots at 1080. The trouble is, I wanted to put this in the pros and here’s why. Yes, you can travel with the Mavic and the Phantom, and yes the quality may be a tad higher, but, you will pay for the higher quality, not just in terms of price, but in another way too. Remember travellers…The higher the resolution, the bigger the file to upload. If you travel to places where the internet is not great (and you will; especially if you plan to travel to India or Sri Lanka) then you are going to become frustrated very quickly believe me. It will only comfortably withstand wind of up to 15mph but we have never had reason to let this stop us taking great footage. And now for some information on the ease of taking the drone into and flying in different countries around the world. When a friend of mine saw that we had travelled to India with our drone she asked ‘how the hell did you get a drone into India without it being confiscated or trashed at the airport?’ it made me realise another upper hand that the DJI Spark has over any other drone. Before we set off around the world I was blissfully ignorant of the fact that some countries won’t let you take a drone through airport security unless you have a permit. Some countries consider the Drone the work of the devil. Just warning you. Because of its size, everywhere we travelled, the DJI Sparkwent along in the flight bag and was sent through the radar screen with everything else in our bag (phones, kindles, chargers etc) without a second thought. Not once was it pulled up or questioned by airport security. It’s so small, that when packed into the carry case it’s very easy to mistake it for a regular camera. 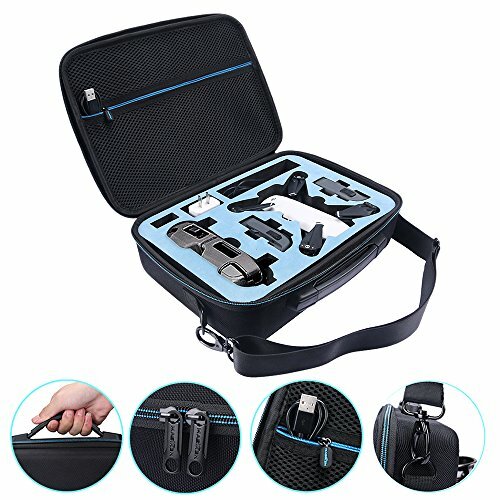 You can buy acarry bag for the DJI Spark[/easyazon_link] too. If this one is too pricey, there are loads of other drone carry cases that are cheaper. We like this one because it protected our drone for over 12 months of travel. We have had the same conversation at every airport we turn up to; whether or not the drone will make it through security. And we always come to the same conclusion. Going through airport security? No problem. We put it into the flight bag. Ever stopped by police for filming? Just once at the nine arch bridge in Ella. We were told to destroy the footage of the tunnel, which we just deleted. We were gutted as there were other people flying drones up around the corner and they weren’t caught. Going through airport security? No problems. We travelled internally in India twice with the drone in the flight bag. Ever stopped by police for filming? We were asked not to film at a dam in Udapuir. Apart from that, we were discreet in our filming. 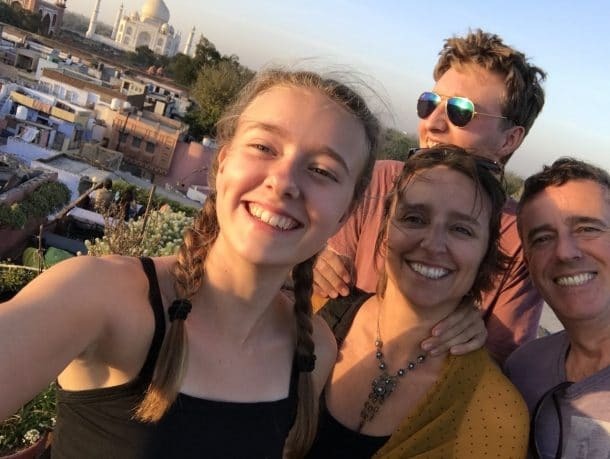 Take a look at some fabulous footage we took for our travel blog in India. A view of Rajasthan in India. By Sonny Deacle. Going through airport security? Absolutely fine. Again, in the flight bag. Ever stopped by police for filming in Thailand? No. Going through airport security? All good. Flew into Hanoi. Going through airport security? No problems. Ever stopped by police for filming? No, although we only tended to fly in rural areas. 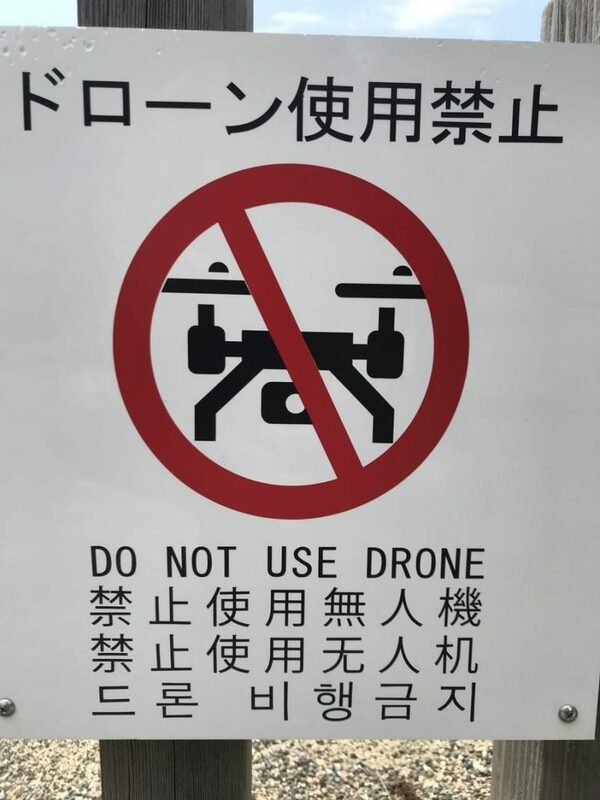 We came across quite a few signs that banned the flying of drones. Japan doesn’t seem too keen on flying drones. Ever stopped by police for filming? We have taken the drone to Croatia, Montenegro, Italy, France and Amsterdam. The only place we were banned from using it (by the Mayor in a tiny hamlet would you believe?) was France. Update!! October. We are now in the UK and have found the public to be the most anti-drone of all the countries we have been to so far! No filming on National Trust property. We even had someone come up to us on the side of a cliff and confront us about flying the drone over the sea!! Unbelievable. So, that’s our recommendation for the best drone for travel in 2019. Without a doubt. All I will say is just be respectful when flying your drone. If you are aware of how others feel around you then you are less likely of getting yourself into hot water. Some people, understandably, get annoyed if they think you are invading their privacy etc, etc. If this is the case I suggest you pack up and move to your next fabulous location. And hide in the bushes! 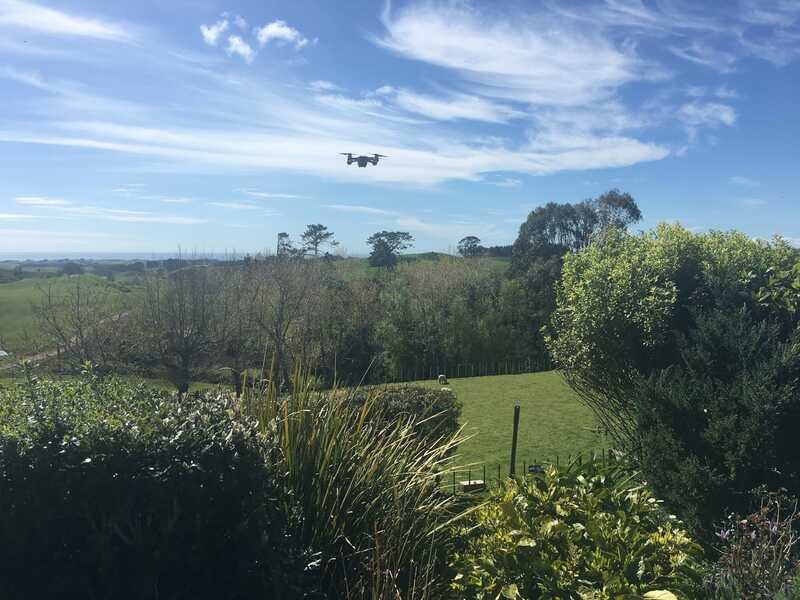 Why not head over to our Videos Page And Take a Look at The Drone in Action in New Zealand! Until then, good luck with your new drone and happy travels! This is a very informative piece, it’s good to know that many countries pretty much allow drones. I too agree that the DJI spark is the best drone for travel. I took mine when we travel to Thailand and captured some good shots of the place. That’s great! Thailand is wonderful for ariel shots isn’t it?! Sorry Rob, we haven’t been there. Good luck though! My Mavic Pro got confiscated at Amman, Jordan airport. Had it in my checked luggage. They took me to an interrogation room and asked a ton of questions…then held it at the airport until our departure a week later. Had it in Beirut Lebanon the prior week with no problems at all. Can you share your experience in Croatia and Montenegro with more details? I will be travelling in those countries in August and was thinking to bring along my drone. Especially Montenegro has now more strict regulations that include registration with local authorities. Hi! To be honest we didn’t fly the drone in Montenegro but there were a couple of people flying their their drone on the beach while we were there and no one seemed to mind. In Croatia we flew the drone but only in woods and out to the ocean. We were never told not to use but as i said, we were pretty secluded so i can’t really say what it would be like in built up areas.